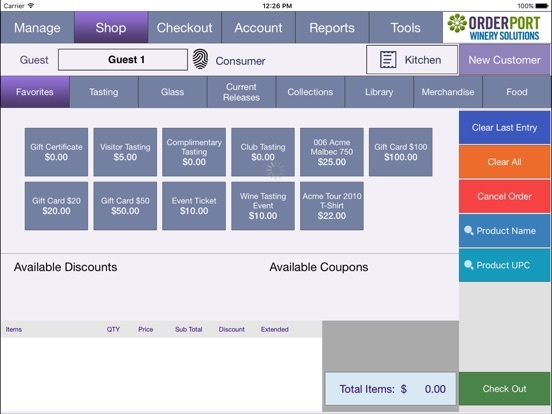 OrderPort POS provides Point of Sale capabilities on the iPad for sales at winery tasting rooms. It is integrated with OrderPort’s complete commerce solution which includes website, eCommerce, mobile commerce, inventory management and wine club administration. The application is integrated with the IDTech Unimag2/Shuttle credit card swiper for rapid and secure, point-to-point encryption of customer transactions. It also provides peripheral access to the iPad integrated camera as well as support for various hardware add-ons including: thermal receipt printers, kitchen printers and Bluetooth barcode scanners. Because OrderPort POS allows the purchase of alcoholic beverages, it carries an adult content warning.